When it comes to new electric power plant construction, these are confusing times. 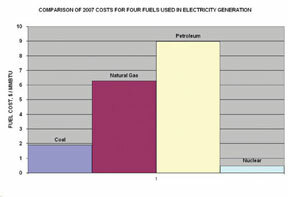 While fuel costs are increasing rapidly, some fuels remain much more expensive than others, such as natural gas (which costs much more than coal, for example). It would seem to be an opportune time to construct plants that use less expensive fuels, such as coal and nuclear power, or use no fuels at all, such as hydroelectric-, solar-, and wind turbine–powered plants. However, electric power plants that use coal or nuclear fuels are more expensive to construct than those that use more expensive fuels, such as natural gas. Those that use no fuel at all—such as hydroelectric-, solar-, or wind-powered plants—are not only expensive to construct, but do not always provide reliable electricity as baseload power. Overall, new plant construction costs are increasing rapidly in an environment where borrowing money is getting increasingly difficult and expensive. From the perspective of an executive at an electric utility, numerous competing considerations exist. 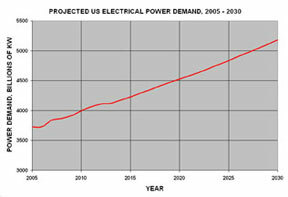 Electricity demand in the United States is projected to increase by at least 30 percent by the year 2030. About a year ago, there were 150 new coal-fired power plants being permitted, designed, or constructed; during the past year, however, 16 of those have been canceled for various reasons (including 8 canceled by a single Texas utility). The estimated cost of constructing a pulverized coal steam electric generating plant (i.e., a conventional coal plant) is estimated to have increased by 130 percent since the year 2000 and by 76 percent just in the 12 months between January 2007 and January 2008 (to as high as $2,500/kW today). The cost of coal has more than doubled in the last 12 months but is still only a fraction of the cost of natural gas (i.e., a couple of dollars/MMBtu, depending on the type of coal, compared to over $13/MMBtu for natural gas). Congress is considering legislation that would require electrical utilities to reduce their carbon dioxide emissions by 70 percent by the year 2050, a move that would force those utilities with conventional coal-fired plants to add sequestration technology to capture carbon dioxide emissions and increase the percentage of renewable and nuclear generation to their portfolio. The cost of constructing a new, combined cycle, natural gas–powered electric plant, which emits no particulates or mercury, no sulfur oxides (SOx), and only a small amount of nitrogen oxides (NOx), is still estimated to be $800 to $1,000/kW and is relatively easy to permit. The estimated cost of constructing a nuclear electric-generating unit has at least doubled in the past 5 years, from about $2,000/kW up to at least $4,000/kW and even, by some estimates, as high as $8,000/kW (so a single new unit now is estimated to cost between $4 billion and $12 billion, depending on its generating capacity). The estimated cost of constructing wind turbines for electricity generation has increased over the past several years from about $1,000/kW to about $2,000/kW. The estimated cost of constructing geothermal electric power plants is estimated to be at least $2,800/kW. The cost of enriched uranium fuel for nuclear power plants has doubled in the past 12 months, but its fuel is only a fraction of the cost of natural gas. The cost of delivered natural gas has increased by at least 50 percent in the past 12 months (from about $7/MMBtu to $13/MMBtu). There is a severe shortage of engineers both to design new power plants and review those designs for the U.S. Nuclear Regulatory Commission. There is a severe shortage of skilled craft labor, such as pipe fitters, sheet metal workers, and insulators, with many of those available now expected to retire in the next several years. Both existing and new thermal power plants (coal and nuclear) must address recent Environmental Protection Agency regulations regarding use of limited cooling water (to limit thermal pollution of rivers, lakes, and estuaries, as well as killing of fish and their larvae). The added cooling equipment can cost hundreds of millions of dollars per power plant site. dominantly by carbon dioxide emissions from fossil fuel combustion is becoming increasingly accepted by the public in North America, Europe, and elsewhere. While there are many concepts for how to sequester carbon dioxide, none have yet been proven on a large-scale basis; hence, its costs are only vaguely known. While nuclear power plants do not emit carbon dioxide or other greenhouse gases, the storage of spent fuel remains politically unresolved. 1970s and early 1980s when millions of dollars were lost on then-new nuclear power plants and some electric utilities went bankrupt from constructing the plants. Permitting a new coal or nuclear power plant in the United States today will probably take several years. While the U.S. public increasingly expresses a desire for renewable energy, they increasingly reject the associated infrastructure, such as new hydroelectric plants that block free-flowing rivers, huge wind farms on mountain tops or within view from the seacoast, and large solar collector arrays in the previously undisturbed desert. Several automobile companies are working on developing “plug-in” hybrid cars that, if successful, could dramatically increase demand for electrical power for recharging. The first item on the list, that electrical power demand in the United States is projected to increase by 50 percent or so between now and the year 2030, is the most pressing issue. Utility executives need to keep existing facilities operating while adding new plant capacity. Most agree that when it comes to investing in new power plants, diversity is a virtue: the different plants owned by a particular utility should be powered by a mix of coal, nuclear, natural gas, hydroelectric, and other renewable forms. There are now 15 new nuclear plants proposed for the country, no doubt with others to follow. In the last couple of years, there have been about 150 proposed new coal-fired plants, some of these to use pulverized coal but others to use circulating fluidized bed combustor technology. For the desert southwest, there are three new steam electric, solar-heated power plants in development. Wind farms, with numerous wind turbines, are popping up all over the country in areas where the prevailing winds are known to be strong (many of these in sparsely populated areas, such as western Texas, Oklahoma, Kansas, and Nebraska). And even with the rapidly rising cost of natural gas, dozens of new natural gas turbine generator plants continue to be constructed or proposed. They can be permitted and constructed relatively quickly (in less than 2 years), and they can be turned on and off almost like an automobile engine in response to sudden changes in electric power demand. There are currently more than 500 coal-fueled, steam electric power plants in the United States. To meet the latest rules of the Clean Air Act, they all must be outfitted with AQCSs to remove most of the emitted fly ash, SOx, NOx, and mercury compounds. Adding new AQCS hardware is being done at an enormous expense by the electric utilities. In some cases, the plants are more than 40 years old; yet given the high cost to construct and permit new plants, financially it is worth keeping them operating. To keep them operating, however, a complete AQCS must be added to each unit, as well as cooling towers, to prevent thermal pollution of rivers, lakes, and tributaries and killing of fish and fish larvae. In most cases of adding new AQCS hardware, an old boiler requires extensive structural backfitting to enable it to withstand a high negative pressure imposed by new AQCS fans. The most publicized case of canceled new coal-fired power plants recently has been in Kansas. Governor Kathleen Sibelius refused to permit two proposed new plants to be located in southwest Kansas, close to the Colorado border, purportedly because of concerns about carbon dioxide emissions and global warming. The Kansas legislature and the Governor’s office have been at odds over these proposed new plants for the past year, with no resolution in sight. It probably does not help that most of the power is destined for Colorado, rather than Kansas, and that with the prevailing winds from the southwest, most of the emissions will blow toward the eastern, more populous parts of Kansas. For companies who might be providing design and contracting services to these plants, there is a lot of uncertainty, making it virtually impossible to plan for the future. The U.S. Department of Energy is going to invest in a coal-fueled demonstration plant that will convert coal to a synthetic gas and then sequester (i.e., capture) the generated carbon dioxide to keep it from entering the atmosphere. As noted in the list of considerations presented earlier, while there are several clever ideas about how to do this, sequestration technology has yet to be proven on a large power plant. Nuclear power plants produce electricity at the lowest operating cost of any form of steady, reliable generation (i.e., not counting renewable forms such as solar and wind, which vary during the day and with the weather, and hydroelectric, which varies with water flow rates in rivers). Furthermore, they do not emit carbon dioxide. However, the unresolved issue of long-term storage of spent fuel, in a technologically sophisticated tunnel system beneath Yucca Mountain, Nevada, has left the future of nuclear power with an air of uncertainty. Additional issues include the increasing estimated cost of constructing a nuclear plant and today’s “credit crunch,” in which it is both more difficult and more expensive to borrow money. While renewable forms of electricity sound appealing at first, an electric utility still must address the realities of variability and unreliability. Solar-generated electricity is only generated when the sun is shining, and wind turbines only generate electricity when the wind blows with sufficient speed. Peak electric demand is typically late in the afternoon, after the strongest solar radiation has passed and prior to the evening’s stronger winds. With the unreliability of solar and wind power, utilities must have back-up conventional power that can respond quickly. This is normally provided by natural gas turbine generators or diesel generators (the former being very expensive to run, and the latter being excessively expensive to run). Using solar and wind power requires carbon fuel-powered generation as backup. 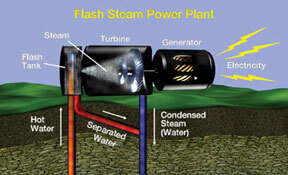 Certainly, geothermal power promises to provide steady, reliable electricity. However, the best locations with good geothermal capabilities are frequently far from where the power is needed. Most good locations are in the northwest (northern California, Idaho, Oregon, and Washington). Finally, there are no proposed large new hydroelectric plants in the United States due to difficulty keeping water levels in some of the largest, such as the Hoover Dam (opened in 1935) and the Glen Canyon Dam (opened in 1964); and environmental challenges faced by all hydroelectric plants, such as those along the Columbia River, mostly built in the 1930s, which have been responsible for major reductions in the salmon count. All types of steam power plants—coal, nuclear, natural gas turbines, steam-producing solar, and geothermal—need extensive quantities of mechanical insulation. Hydroelectric plants, wind generators, and photovoltaic solar generators do not need mechanical insulation. If the next 10 years promise about 150 coal-fired plants, at least 15 nuclear units, and several steam-solar plants, billions of dollars of insulation opportunities will arise as part of this new infrastructure. But, given hurdles such as environmental laws, the cost and availability of capital, the shortages of labor, and construction costs, there is a great deal of uncertainty about the future. This is the business environment we face during the next decade in the electric power industry. It will be a challenge for all of us. 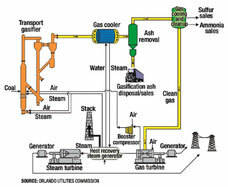 Coal gasification promises to produce electrical power by first converting the coal to clean-burning syn-gas, with the emissions free of fly ash, SOx, NOx, and mercury compounds. With only water vapor and carbon dioxide emitted, it would be easier to sequester the latter, a suspected greenhouse gas. However, this type of power plant would be very expensive to construct—at least 20 percent greater than the cost of constructing a conventional pulverized coal plant.